Our weekly planetary meditations continue this week, with the focus on peace and healing for the Earth and her inhabitants using the beautiful heart shaped chunk of rose quartz shown below. Hope you can join us tonight and next Monday 31st July through 8pm GMT. Just returned from a lovely trip to Arran in Southern Scotland. Crystal planting included Dunkeld Cathedral on way down and carin to cliffs beyond Scabster on return journey, and to mountains, a burial cairn, and in and around North Newton whilst we were there - further details to follow in a couple of weeks. I know of other work ongoing in Mallorca, Spain and in Cornwall, England as well as here in Orkney. If you have any further crystal planting news to share please feel free to post on our Facebook page or email me details as it is always inspiring and useful to add to our records as the work grows. As always a huge thank you to all for your continued interest and support! 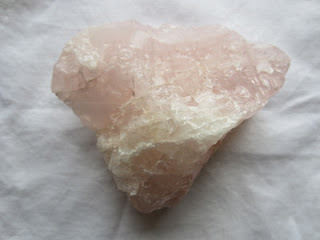 This meditation will use the heart shaped chunk of rose quartz shown below. Hope you can join us in meditation, positive thought or prayer, from where ever you are based across the globe. As always many thanks for your connection and helping others in need.